Incentive Payroll (IP) enables apparel and sewn products companies to manage and simplify piecework payroll calculation and shop floor control. The Microsoft®.NET® based solution helps manage operations, styles and cut orders. The printing of bar-coded bundle tickets, submitted on gum sheets makes data collection easy via a USB hand-held scanner. Pay Codes are defined to calculate both on standard and off standard pay, as well as make-up (daily or weekly), overtime premium, small bundle premium and shift differential pay. Each of these gross pay types can then be consolidated and transferred to a gross-to-net payroll system (ADP, PayChex, Performance Payroll or .csv file). Labor cost reports by department, cost center, or plant show where excess costs exist in the manufacturing operation. The system can also be set-up to manage a single sewing plant or configured for central cutting/remote sewing. 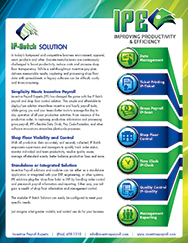 IP can be integrated with 3rd party ERP systems to eliminate double entry of data. ERP production orders can be sent to IP, and production order (cut) completed quantities can be directed back to the ERP system on a daily basis. IP also integrates with Eton and GerberMover unit production and other production systems. This module houses the operation and style libraries, and allows issuing of cuts and printing of bundle tickets (barcoded for scanning purposes). This module includes employee and pay code data to calculate employee gross payroll. Bundle tickets on gumsheets are scanned and processed. Make-up, overtime, small bundle premium, and other off standard pay is calculated. Flexible Pay Code setup makes the incentive pay formulas almost limitless. The system will also automatically calculate employee averages (based on each company's individual way of calculating averages). Gross pay categories are combined appropriately and then sent to a gross-to-net payroll program (ADP, PayChex, Performance Payroll, etc.). Direct and indirect labor costs are also calculated and reported. This module automatically captures employee work time (by department and pay code). Biometric time clocks can be used to eliminate "buddy punching" and also employee badges. The clocks read the geometry of the employee's hand to verify their identity. Another time clock option is to use a touch screen time clock and badge swipe to allow employees to clock in/out, and to change departments and pay codes. This module uses handheld computers to scan an integrated quality barcode that resides on the bundle ticket (even though the operation ticket has been removed by the sewing operator). The auditor randomly samples in-line bundles and scans the sewing operations being audited, defect codes and quantities are entered for any defective operations. In-line audit reports can then be produced to show which operations, styles, cuts, & employees have quality issues. This module allows graphical design and printing of product care labels. 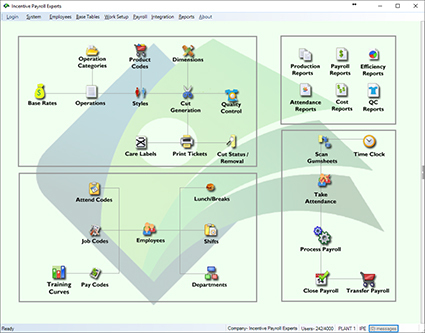 CarePro is completely integrated with the ticket printing module. So, when a cut is defined in IP, product care labels can then be automatically printed for production orders.